Chicago — As intense weather events batter U.S. coastal cities and offshore islands, a new study from the Midwest Economic Policy Institute warns that the threat of climate change extends much farther inland, with potentially devastating impacts on transportation and infrastructure systems across the Midwest. Climate Action Plans with greenhouse emissions targets; and adaptation plans with asset management programs that can help state and local governments identify at-risk systems and develop cost-effective alternatives. 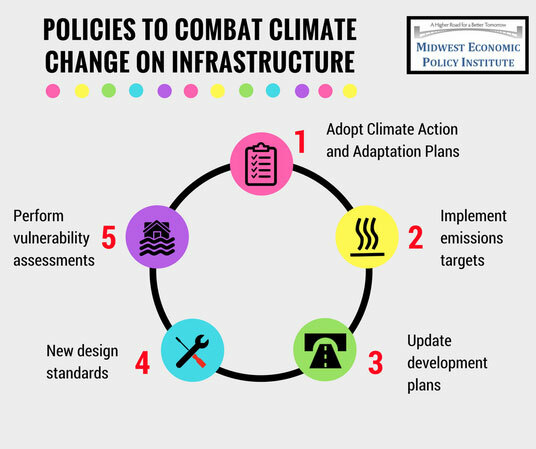 Read the study, Climate Change and its Impact on Infrastructure Systems in the Midwest, at https://midwestepi.files.wordpress.com/2017/10/mepi-infrastructure-and-climate-change-final.pdf.